Amino acids are the molecular building blocks of protein, the same protein structure, the way our body breaks them down to digest and assimilate. A protein is nothing more than a collection of amino acids. Their importance in muscle building is indisputable We know of 20 of which 8 are essential. Essential means that the body must find them as is through food (or protein powder) and is unable to synthesize them alone. Our body has a continuing need for amino acids simply to function and renew its cells. Everyone, athlete or not needed, but it's even more true for those who train intensely. To be in a growth phase, the muscle must reach synthesize more protein than it degrades. This will be achieved by a sufficient protein intake : the amount of protein made ​​exceeds the amount of protein destroyed, this is called positive nitrogen balance. There are 20 amino acids mentioned basic by the genetic code. These are: Aspartic acid, glutamic acid, alanine, arginine, asparagine, cystine, glutamine, glycine, histidine, isoleucine, leucine, lysine, methionine, phenylalanine , proline, serine, threonine, tyrosine, tryptophan and valine. Of these 20, eight are called essential. These are: isoleucine, leucine, lysine, methionine, phenylalanine, threonine, tryptophan and valine. The rest are non-essential, it means that the body can source these amino acids through food otherwise is in making himself (synthesizing them from other amino acids). Three non-essential amino acid can be based in some cases essential. In infants, for example, histidine and arginine are essential. Glutamine is essential in trauma patients. The role of protein and strength training are intimately linked. Indeed, during muscle strain, the muscle fibers contract and suffer damage. The higher the workout intensity is, the more the muscles are weaken and can be damaged. The onset of muscle soreness, lactic acid increases with these traumas. To repair itself, the muscle draws into proteins (amino acids) available in the blood and to prevent damage of the next drive to come, it will strengthen, thicken, giving orders to his cell muscle to grow and allow them to recover better. Some proteins or amino acids have nothing to do with building muscles,enzymes, hormones ... their role is to transport oxygen, transmit nerve impulses, aid digestion and boost immunity. It is sometimes forgotten but the proteins have the same energy as carbohydrates (1g = 4kcal) value. The difference is that carbohydrates are quickly and easily accessible. That is why we recommend using mainly protein (or amino acids) for weight loss in the form of hyper-protein diet. As part of the mucles building phase, on the contrary, we must avoid using protein as an energy source, because in this case it would be detrimental to the muscles. The amount of protein (amino acids) that you have in the blood will determine the ability of your muscles to recover, regenerate and strengthen and be in a condition of growth. 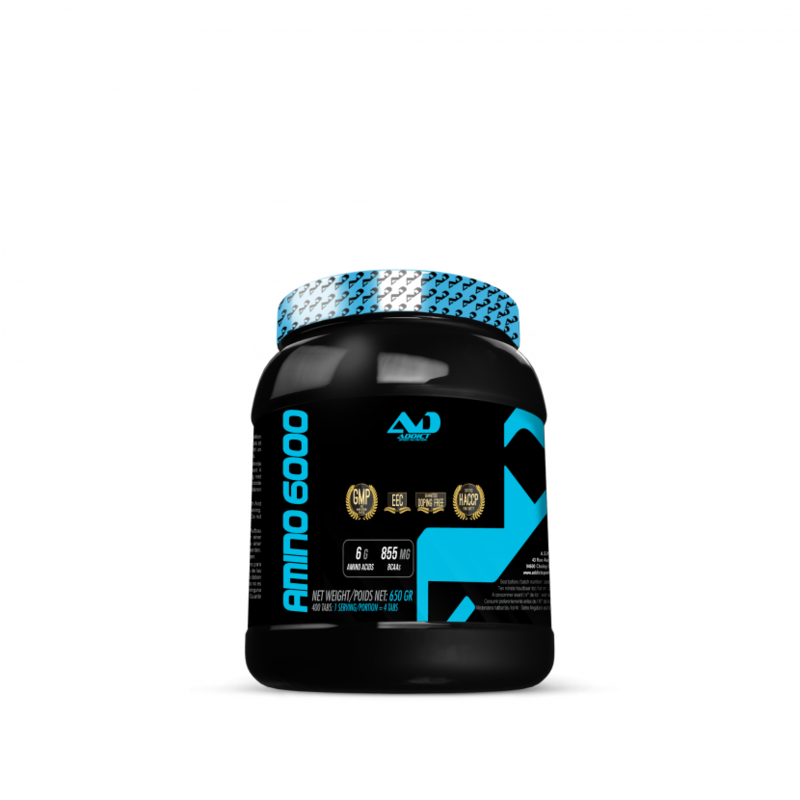 We consider here the particular anabolic role of amino acids. In blood, the amino acid levels must be balanced. To maintain this balance, the body has two valves, anabolism or catabolism. Too few amino acids in the blood? The body must draw on its amino acid reserves are the muscles to restore this delicate balance. By ridding the muscles of its amino acids, the body triggers the catabolism and destroys muscles. In contrast, an influx of amino acids in the blood? The body has to deal with this influx by tapping into this reserve and redistributing in the muscles that are responsible for amino acids and develop. This helps explain why it is so important to provide enough amino acids to the body through weight training. Take 4 tablets daily, before meals and after training.